When we think about investing it is useful to think about it in terms of risk – how much we should take, and how much can we afford to take to reach our goals. Therefore, it is relevant to ask, how actively should we change our risk level to respond to events or economic news? We always urge careful deliberation when considering changing your risk level, because you will be altering the long-term mix of assets in which you invest – and the expected characteristics of your portfolio as a result. These examples give you an idea of how different risk levels may perform. Source: Netwealth; Strategic Asset Allocations and Historic Returns for the period 1992 -2017. 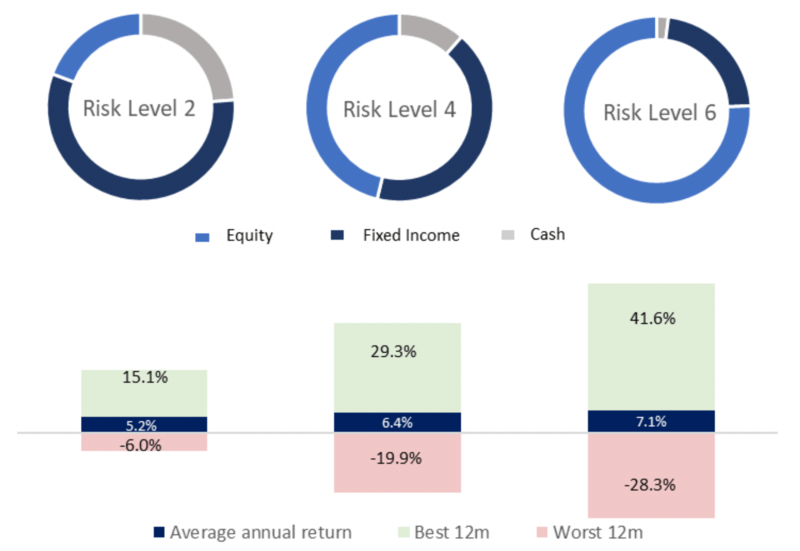 As you can see, changing your risk level could have a big impact on characteristics of your portfolio, potential returns, and your investment experience. Yet when is it necessary to make changes to your portfolio? When markets experience a downturn it may feel intuitively right to reduce risk to protect your capital. This can actually result in the opposite happening when taking a longer-term view, and we should always be wary of the financial effects of behavioural biases when we manage our money. If your portfolio is suitably diversified then the impact of market falls will likely be temporary. Change your risk level in response and you could essentially lock in a loss. The key is to focus on your longer-term objectives and accept that you will see some short to medium-term fluctuations, remembering it is the longer-term outcome that matters. While it is tempting to lock in profits when markets have been strong this creates a challenge for the future. When do you increase risk again or get back into the market? If your time horizon and objectives haven’t changed then it is best to remain invested for the long term – as this article shows – rather than trying to time the market. Accept that you are aiming for an average return, which will be made up of some good years and some bad years. You should only consider changing your risk level when something has changed in your life. This could be a major life event like having a child or retiring. Major life events will likely impact one or more of the three factors which help you decide the most appropriate risk level to achieve your investment goals. Your ability to take risk is driven by your overall financial circumstances and for how long you wish to invest. Your willingness to take risk represents the level of fluctuations you are willing to accept in the value of your portfolios and in the size of a potential short-term, medium-term and permanent loss. Your risk need is the amount of risk you may need to take in order to achieve the returns required to meet your goals. When faced with a major life event, the factors above should be considered to help define the change in risk level needed to respond to your evolving needs. It’s a well-proven rule, that the greater the return you would like to achieve, the more risk you will typically be required to take. And while taking more risk raises the potential of losing money, investing for longer gives you more time for your portfolio to recover from any possible losses – which again reinforces the benefits of staying invested. If you make changes to your Risk Level when your circumstances haven’t changed the impact can be stark. Below we look at a client investing towards their retirement in 15 years and drawing an income over the next 30 years. If they invest through a Risk Level 5 portfolio our average return scenario estimates that they will meet their objective of generating £3,000 a month of income, inflated by 2% each year, in retirement. Source: Netwealth Investments. Assumes £600,000 invested for 15 years before income taken. Monthly withdrawal is £3,000 per month inflated by 2% per annum from today. Simulated historic and future performance numbers should not be relied upon as an indicator for future portfolio value. If they were to reduce their risk level to Risk Level 3 you can see from the projection below that this would have a major impact. In this case the average return scenario suggests they would run out of funds over nine years earlier. It is important to consider the longer-term impact on achieving your goals when making any changes. As we have explored, there is generally no need to think about changing your risk level according to how markets behave. Short-term fluctuations are to be expected, both up and down. Once you have established the appropriate risk level for your goal, the best advice is to sit tight. Only if something changes in your personal circumstances or your objectives should you consider making a change to reflect your new requirements.